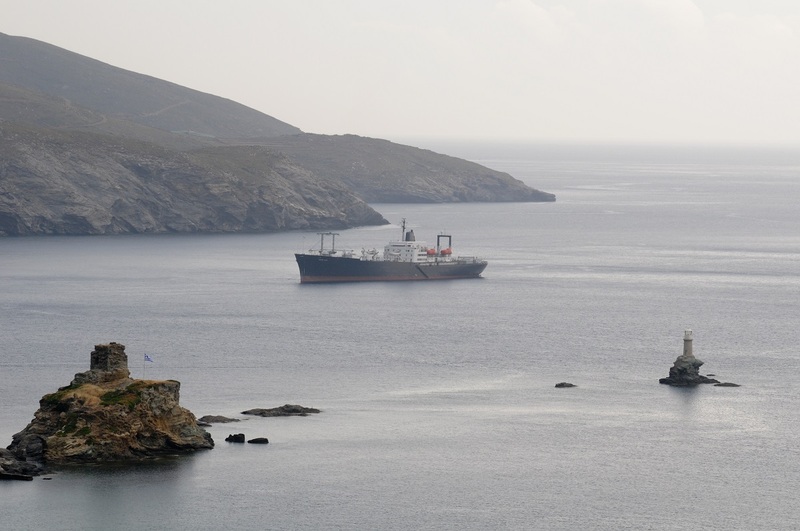 The pilot sail training scholarship program “Eidothea 2014”, is part and continuation of a procedure to create an integrated model of experiential professional orientation for the seafaring profession which commenced in 2009 with initial focus on the young people of Andros Island and aim its establishment on an annual basis and its gradual expansion on a Pan-Hellenic level. 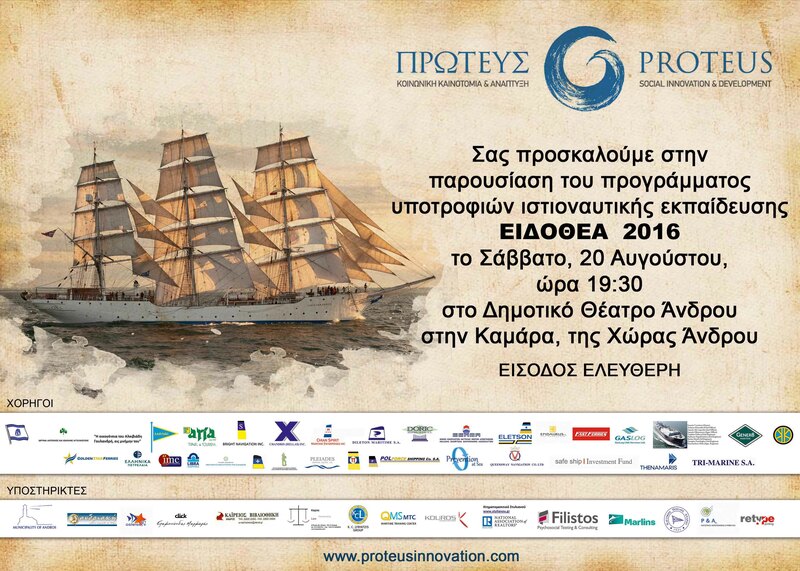 This model includes presentations and speeches by professionals in the seafaring profession and the shipping industry (Pame Thalassa 2010), educational visits on ships and areas of professional activity (Educational Visit of the Andros Nautical Highschool to Syros Island 2009, As Salparoume 2010). With the “Eidothea” Program, we give the opportunity to young men and women, junior high school and high school students, to board, sail, live and work on a ship for some time. 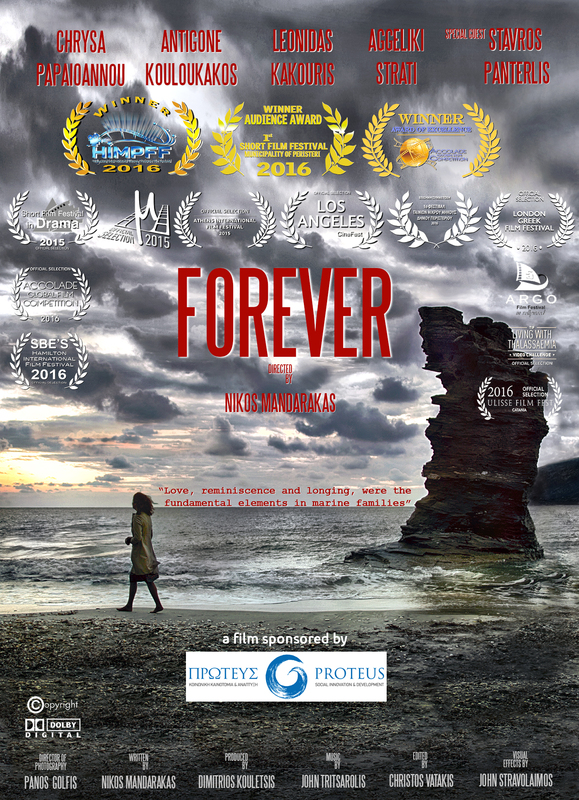 The program aims to raise awareness to the participants about the life and work at sea and simultaneously through the sea life to open their horizons. Side benefits of this program and the overall effort is the transfer of experiences of the participants to their social surrounding, and through that the improvement of the image of the seafaring profession in the society. Many of the tools and procedures that were used for the preparation, risk assessment, selection of the training Tall Ship «SØRLANDET» as a partner and training platform, and the trainees-scholarship recipients, as well and the additional requirements that have been asked from the trainees for the successful completion of the voyage, have been adopted from best management practices used on board the vessels of the Merchant Marine Fleet. The guidelines of TMSA Element 3A, that refers to the recruitment, hiring and training of the human resources on ships were also evaluated in structuring the program. What are the Sail Training Programs? Sail Training programs are educational programs that are offered on training sailing ships often in large traditional square rigged Tall Ships whose main objective is to provide the technical and interpersonal skills required to command a Sailing Vessel with safety and efficiency. This kind of education is particularly instructive for young people, which gives them some of the basic skills of life, enriching their character and better preparing them for life’s demand in a world that is constantly changing, becomes more complex and demanding. 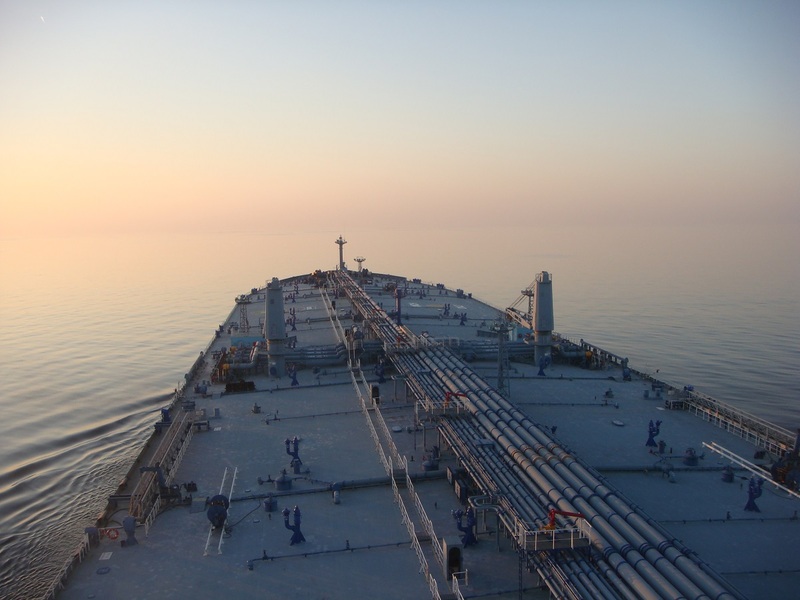 What are the modern needs of the Merchant Marine Industry? The modern ship management needs require to be staffed with specialized human resource at sea, but also ashore. This human resource needs besides the basic technical skills, seamanship and navigation, to have and to continuously develop skills in leadership and management sectors, in an environment that is constantly changing, with multinational composition, and with requirement for continuous improvement and value creation to all the interactive members of the industry, in order to preserve competiveness, improvement of quality, safety, and sustainability. The Sail Training experience provides young people with a professional orientation in an experiential level, basic seamanship skills, but above all it cultivates basic human values and the love for the sea, which are the foundation to develop an integrated person and future professional. What does Sail Training develop and offer? The entire fore mentioned are gained under the supervision and guidance of professional instructors and crew, and in accordance with high standards of safety, management and training. The non-profit foundation “Sørlandet” goal is to own, operate and keep the full-rigged ship “Sørlandet” for future generations to enjoy. Our ship is the last original built tall ship in operation, built in 1927. The “Sørlandet” was a boyhood dream of the ship owner, O.A.T Skjelbred, who experienced firsthand what a lack of a seamanship education meant for a young seafarer. He first set foot on a sailing ship at the age of 13.5 years old. At the age of 23 he became a captain and ship owner and became one of the wealthiest persons in Norway. O.A.T Skjelbred gave the “Sørlandet” as a gift to the region of south Norway, which I called “Sørlandet”, to educate young seafarers. Since then over 10.000 young boys got their education on board the “Sørlandet” and continued on to the Norwegian Royal Navy or the Norwegian Merchant Navy. The Sørlandet stopped working as a school ship for seafarers in 1971 and was sold to a ship owner as a private yacht. She was sold back to the grandchild of O.A.T Skjelbred in 1979 and given by him to the municipality of Kristiansand. Since 1981 the ship has been owned, operated and kept by the non-profit Foundation “Sørlandet”. The “Sørlandet” was run on a seasonal basis offering shorter sail training voyages to sail trainees of all ages. Since 2010 the ship has been operating on a year round basis, where a Canadian International College is hosted in the autumn and winter, while the ship offers its summer programs in the summer season. The summer season of 2014 the ship was offering the most comprehensive sail training program in its sector. The “Sørlandet” offers the best and most authentic sail experience available to sail trainees. 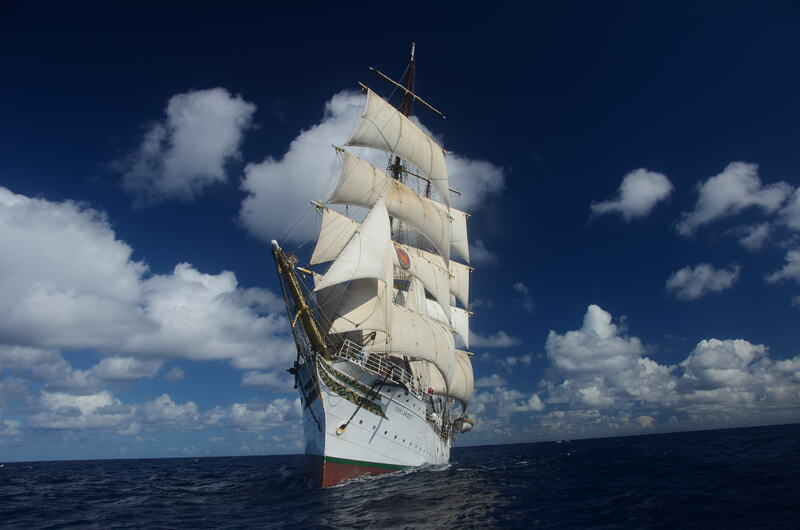 The “Sørlandet” is the most authentic kept full-rigged ship in operation. The ship is under protection by the Norwegian Ministry of Culture, as the most significant Marine Cultural Heritage of Norway. Her sail trainees move over 500 tons of ship with the help of their own muscles and forces of nature, no mechanical winches or motors are used when she sails. To maximize the sailing time compared to time motoring the estimated speed has been reduced to below 4 knots in order to maximize the use of sail and not prioritizing in speed, but in sail training. In addition to this, the “Sørlandet”, has educational programs on board to teach her sail trainees practical skills in traditional seafaring like making rope, mending sails and navigational knowledge. 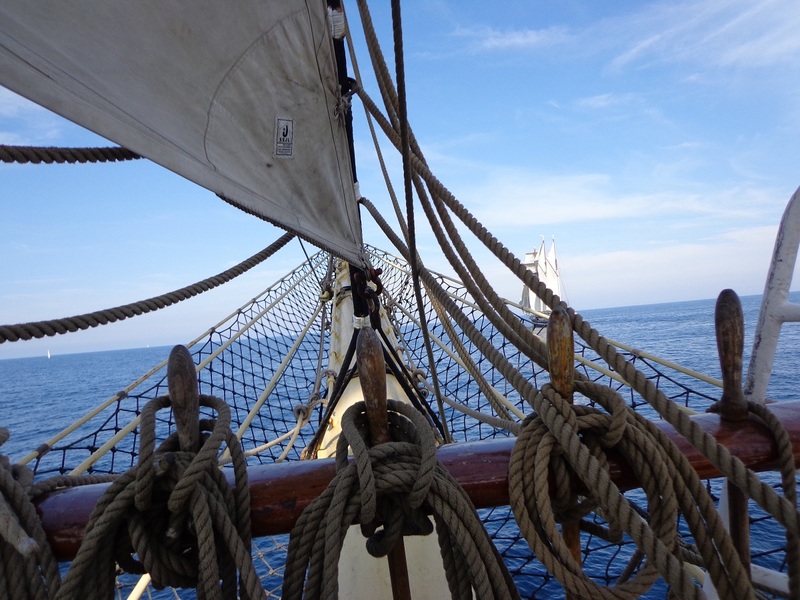 For 2014, “PROTEUS SOCIAL INNOVATION & DEVELOPMENT” organized and carried out the due diligence for a Pilot Sail Training Program aboard the Norwegian Tall Ship “SØRLANDET”. This pilot program provided the opportunity to a young 15 year old, student of Andros Island, to participate in a voyage of around 20 days for sail training at the North Sea. This years’ trainees voyage aboard the Tall Ship “SØRLANDET” commenced at Lerwick, Shetland Islands on the 26th of June 2014 and was completed at Fredrikstad, Norway on the 14th of July 2014, with intermediate stops at Edinburgh, Scotland on the 30th of June 2014 and Harlingen, Netherlands on the 5th of July 2014, where was the starting point of this year’s International Tall Ship Regatta, with ending at Fredrikstad, Norway. In the last leg of this years’ training voyage a member of “PROTEUS SOCIAL INNOVATION & DEVELOPMENT” sailed aboard the Tall Ship, in order to be briefed by the trainee and the crew about the program and the voyage and to make an evaluation for future improvement.